Also Known As: “Grip the club like you are holding a tube of toothpaste”. Through a metaphor this swing thought instructs you to grip the golf club softly at address and throughout your swing in the same manner that you would if you were holding a small bird. In effect it is recommending that you lightly grasp the grip of the club so as to just hold it in place in your hands, while not applying too much pressure with your fingers or otherwise. It is believed that Sam Snead came up with this visual image. At the very least we know he recommended to other golfers on a regular basis. The swing key of holding your club like you would a bird promotes a light grip pressure which helps relax forearm and upper arm tension. It also promotes feel, allowing sensations to flow from the club to the fingers and ultimately to your brain. Furthermore, this swing tip encourages a constant grip pressure which is one of the many keys to a successful ball strike. Indeed, in using the alternative analogy of holding a tube of toothpaste if one were to suddenly start squeezing the grip strongly after initially holding it lightly the end result would see toothpaste flow out from the tube. Going back to the bird metaphor tightening your grip pressure during the course of a swing would likely have fatal consequences for our hypothetical bird. Counterintuitively enough, gripping the club too firmly can lead to weaker shots and those weak shots will tend to fade or worse slice. 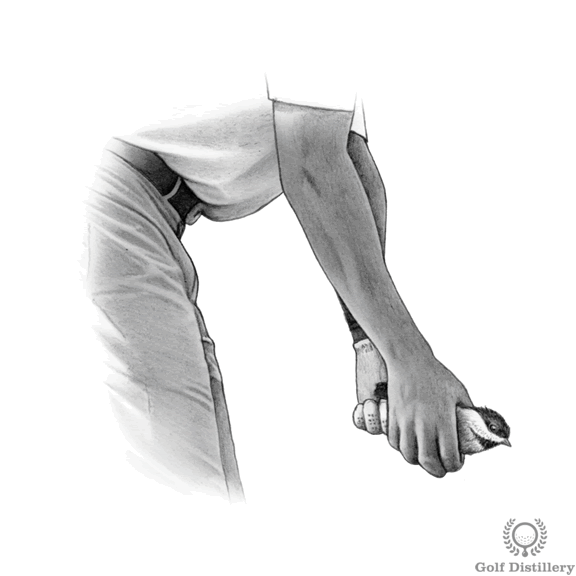 This is due to the fact that a very firm grips restricts clubhead rotation. Additionally, this swing tip should help golfers who are playing with too much muscle tension in their hands and arms, allowing for feel to naturally flow from the club to the fingers. One can tell if he is gripping his club too tightly by noticing how often he changes his golf glove. He could also tell if he is developing calluses on his hands on a regular basis. While it may at first seem that adopting such a light grip pressure will lead to catastrophic results in the form of seeing the club fly into the air during the backswing the fact is you’ll instinctively and automatically apply sufficient pressure as soon as you start your takeaway. By starting with a soft grip at address you are helping your chances that the grip pressure at the top of the swing – and at impact – will not too be strong. Most importantly you may want to consider focusing on this swing key whenever you are putting or chipping. In those instances maximizing feel and relieving muscle tension should be priorities. Plus there are no reasons to warrant a very firm grip pressure for those shots in the first place anyways. Additionally, you may fill your head with this thought whenever you feel the pressure increasing in a tight or important match. In those circumstances trying to grip lightly will allow your swing to flow freely and it will not be restricted by muscle tension.